If you'd like to add some starting calendars to your Calendar List, this step will assist in doing that by providing a list of common calendars, including holiday calendars for many countries and religions. If you don't want to add any calendars, simply click the Next button to proceed to the next step. If you'd like to add calendars later, you can access this same list from the Add Public Calendars command of the File menu. An expandable list of categories is displayed on the left side of the screen. Simply click a category and it will expand to list the available public calendars belonging to that category. To view more information about a calendar, click the calendar in the list. 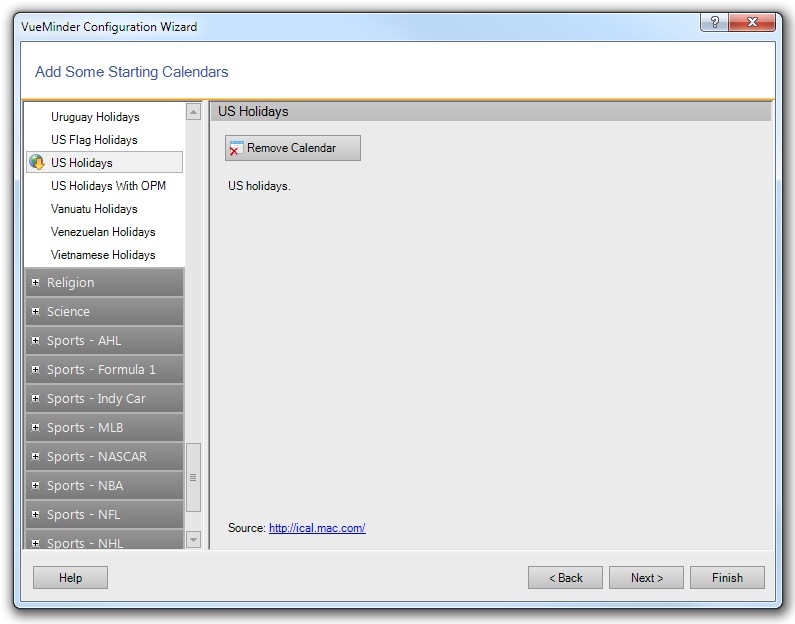 The window will update on the right to show the selected calendar's name, description, and online source. After you've found a calendar you'd like to add, click the "Add to Calendar" button. The button will change and the calendar icon in the list will update to indicate the calendar has been added, as shown in the screenshot above. A new subscription will be created and the calendar will be added to your Calendar List. If you later decide you don't want the calendar, you can delete it using the Delete command on the main toolbar. You can add as many calendars as you'd like. When done, click the Next button to proceed to the next step in the Configuration Wizard.